'14 GWAS LF/BG Reserve Champion! at nearly 5 yrs old -- winning Color Champ in halter! Judge's Choice and 4x Spirit Winner! Sire: Patagonia's Lennox, sire of champions! Rose is a beautiful uniform medium rose grey with lighter heathered legs and a white face and tuxedo marking. She has full leg and face coverage with captivating 'movie star' dark eyes combined with adorable fuzzy ears. 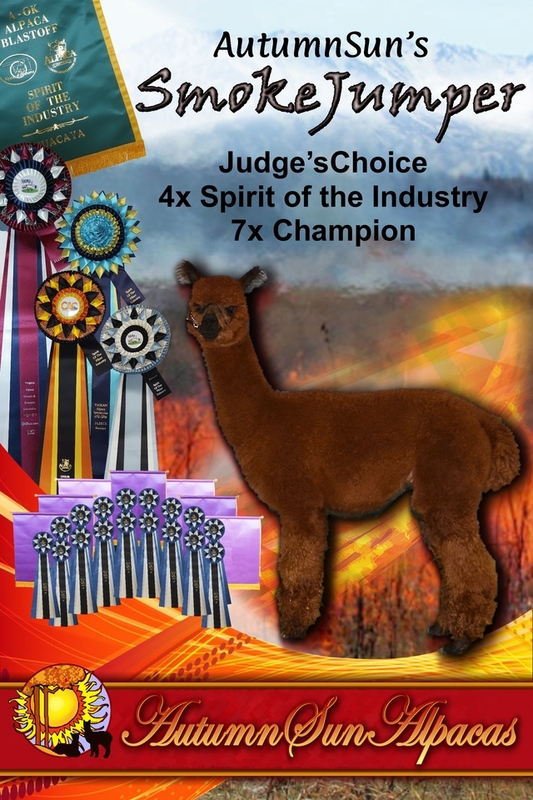 As a four year old with awesome fleece that is maintaining fineness, uniformity, and crimp as he matures, Smokejumper is taking home champion fleece banners, along with the coveted "Spirit of the Industry" awards (along with glowing comments from the judges!). We had quietly tucked him away on our farm as a hidden gem, since each year's new crias took precedence in our limited show string. Until one day we looked at him, now a mature male, and were amazed at his fineness, crimp style & consistency, and uniformity across his blanket. Jumper's dam is our champion grey female, Rosie, who herself has carried a fine fleece long into her maturity. Her other sons, Dauntless and Longbow, also have won their share of banners. Longbow himself won color champion with his 3 year old fleece! Jumper's sire is none other than the pivotal male Patagonia's Lennox -- a world before his time in propelling dark colored programs into fine and crimpy fiber. Jumper has secured excellent placings from his juvenile days, showing against his sire's other sons and grandsons, that hinted at the genetics that would have him continuing to produce fantastic fiber as he matures. His first show as a juvenile was TxOLAN 2013, in March -- wet, humid and freezing. Coming from our dry cold Colorado weather, this was a trifecta of distressing environmental conditions! Nothing like having the fans on for the humidity when you are so cold that your teeth chatter! 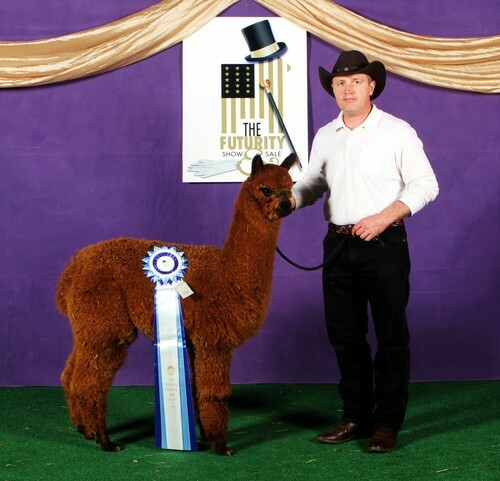 His fiber still looked fantastic, and he placed 2nd to none other than his 'nephew' from Patagonia, an Ernesto son. A tough competition, with these young males standing like matching bookends at the top of the lineup. The judge commented that we were really going to like his fleece when his cria fleece comes off! Jumper held his head high at the 2013 Futurity in Dark Bred & Owned Juvenile to secure 1st place among a lineup of several impressive animals from CCNF and Snowmass in the B&O classes. His last show as a juvenile in 2014 was the always-competitive, level-V Great Western Alpaca Show. He took 2nd in a close pairing to his (same age) nephew, with them standing there like brothers rather than uncle/nephew, over males of notable bloodlines such as Matrix Majesty, .38 Special, Snowmass Reserved, and MFI Beaumont. At 2015 GWAS as a yearling, Jumper secured an hard earned third in another tough class, standing shoulder to shoulder in good company: below a Snowmass Matrix Majesty son and above sons of Crescent Moon's Simtustus and Aussie .38 Special! Along with Dauntless, he helped to win 2nd in dark Produce of Dam for our Frosted Red Rose -- an amazing feat for a grey and brown for their grey dam, since solids usually beat out greys! Jumper continues to show the 'right stuff' as a mature male, placing high among excellent competition in both halter and fleece. This boy has the genetics, fiber, and looks to be a cornerstone herdsire. 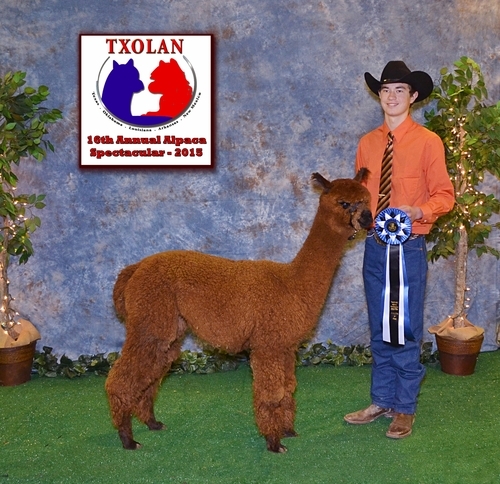 Color Champion - 2018 TXOLAN Spectacular Halter Show -- at 56 months old! J.Anderson had favorable comments about his fantastic uniformity, fineness and density. 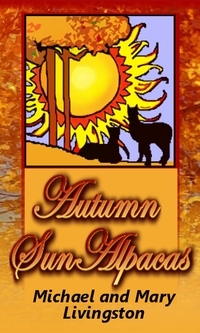 Reserve Champion - 2014 ABR Fall Festival, brown males, K.Buhrman -- as a Juvenile! 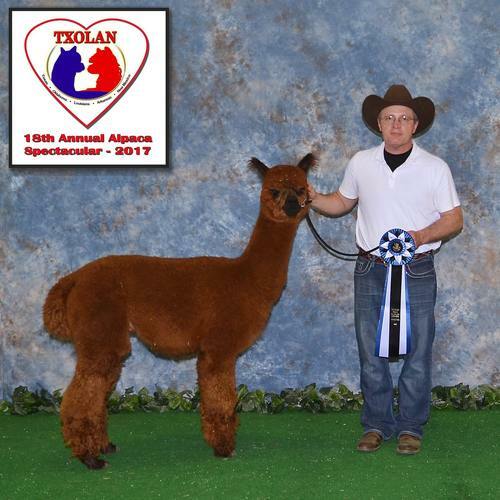 1st - 2015 TxOLAN Spectacular -- MB Yearling males - A.VandenBosch "advantage for degree of fineness within his fleece," "very nice uniformity... carried through with really, really fine and soft handling fleece", "pleasing style and frame". 2nd - 2015 GWAS, PRODUCE OF DAM for Rose, along his LRG brother Dauntless -- A grey and brown taking 2nd, that's great! 2nd - 2014 GWAS, MB Juvenile males - P.Kennedy -- out of 10 in his class with 1st/RC and the CC being his Patagonia relatives.